October 2014 | I Believe in Joy! Don’t let the holidays scare you with all the unhealthy sugary options…choose this adorable and delicious Friendly Ghost Jicama and Dip Halloween Snack instead! Jicama are a healthy alternative to chips and can be used with a variety of dips. This snack is perfect for after school, a school or work party, or to serve your kids. It can be switched up to adapt for any time of the year using your favorite holiday shaped cookie cutters to fit any season of the year! It is SO easy and healthy too! Enjoy! This recipe was also featured in San Diego Family Magazine’s Snacking with Joy! Subscribe to SDFM today! Healthy, easy, and totally fun, this snack is perfect for any occasion!! My kids gobbled up this healthy and fun treat and loved it! Any cooking or cutting needs to be done by an adult. Thanks! I had SOOO much fun making this Halloween Snack with my daughters who are allergic to nuts. This snack was also featured in San Diego Family Magazine’s Snacking with Joy column. Subscribe to SDFM today! Enjoy making this fun and healthy snack together! We sure did! Healthy and fun, this allergy friendly snack is perfect for Halloween or any time of the year! Enjoy your beautiful and yummy Pumpkin Patch Snack for Halloween or all year long! All my recipe cooking and cutting needs to be done by an adult. Thank you! 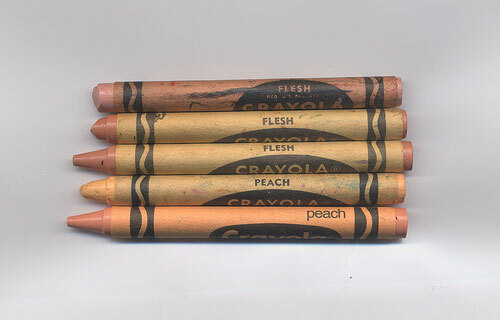 I am sure you remember not too long ago when the Crayola Peach crayon used to be called the “flesh” or “skin color” crayon. When the company considered that more than light fleshed people may want to draw or be drawn, the name was changed to Peach. There is so much I could write on this topic. But, I will start here. It only took me about a year to be calm enough to write this post. Being a Mom in family with Biracial children comes with a new set of emotional, mental, and spiritual territories to explore and to allow God to mature. Our family is a beautiful blend of two different cultures. Over the last 13 years of marriage we have faced amazing support from some members of society, and also heartbreaking opposition by other members of society. Each day that goes by, we choose to respond with love, strength, and unbreakable joy – even joy that is chosen through burning and enraged tears. We strive daily to tell our children how much they are valued, loved, and created individually, with beauty and uniqueness. We teach them Bible verses such as, Psalm 139:13 “For you created my inmost being; you knit me together in my mother’s womb.” But as parents of Biracial children, it is not just what we say to our kids that matter, but everything we actually believe. Routinely stopping and examining our hearts. To reveal our own biases and prejudices about life, people, and situations. To purposefully and intentionally foster a heart of love and celebration for unique differences, and not to fear differences. Our children learn what they see us live – not just what they hear us say. So, what does this post have to do with “Skin Colored Crayons” you ask. Everything. The fact is, as parents of Biracial children, we can be very intentional. We can believe in the beauty, pride, and confidence that has been delicately sown into our children from their moment of conception. We can have full faith that each child is unique, beautiful, and full of strength. But it is only a truth of our life, until it becomes a reality in theirs. How can we foster that process of transformation to happen in our kids? Here are some guidelines we have adopted in our home that have helped us as parents of Biracial children. 1) Always speak positively (words are medicine) of both cultures in our family. 2) Always stand up for, with respect, and non-violence, both cultures in our family. 3) Refuse to allow racist influences (of any culture) into our home. We don’t tolerate it. 4) Never say comments that imply choosing a race, such as “you are my white child to one and you are my black child to another”. All my children are Biracial. The color of their skin is purely the beautiful way that God designed them each genetically. They will always be part of two cultures. They never have to choose one or the other. Encourage them to discover and embrace them both, with unlimited love. 5) Spend time together. It can be weekly family nights, regular family camps, community service projects together, and going on regular parent / child “dates.” We can make our family the first place our children belong. One of our family goals is every day to make sure that our children know they always “fit in”, right here – with us. 7) Daily, seek the heart of each of your children. Every person is different. We all learn, communicate, receive love, and process feelings in different ways. The same is true for our Biracial children. Every day, in my quiet time, I ask God to give me a view of His heart for a specific one of my children that day. The result has been phenomenal. We have seen a greater heart connection and found individualized ways to encourage each child’s unique path. “Joy – Still, I ask you, what does this have to do with Skin Colored Crayons?!?!!!? Well, that was the day I will never forget. It was, in a sense, a test. Was all this intentional parenting of Biracial children working? Were our kids processing their own self esteem and was it making positive change in their own world? My 7 year old daughter came home from school (before we started Home Education). We went through the usual banter as we discussed the highs and lows of her day. The next phrase out of her mouth caught my attention and I stopped looking through her backpack and sat down. She then smiled, with huge confidence, and pulled out her family drawing from her folder, “Want to see it Mom? !” Her eyes sparkled with excitement as she showed how she made details of her dress to match her hair, and how she and her Daddy had the same eyes, and how she was holding hands with her little sister. Each person’s body was drawn with a different shade of crayon, and each person in the picture was smiling. She added small differences to each person – one had blonde colored hair, one had curly big hair, one had braided hair. No person was exactly alike. And yet, when she put all the unique members of her family on paper together, it made a picture she was more than happy to love, stand up for, and bravely share with the world. In my opinion, that is passing the test. To my Baby Girl: I made this in honor of you. With every breath I have, I will love, stand up for, and bravely share the uniqueness of multicultural families and Biracial children, with the world. Keep drawing and living your dreams. The world shines a little bit brighter today, because of you.